People around the world are taking a stand for our planet by making more mindful choices and seeking out companies with sustainable and transparent practices. This is the year to make conscious decisions—long before your products end up in a trash bin! However, just like sticking to a healthy lifestyle or a solid sleep schedule, things always tend to get a bit hectic when you’re away from your normal routine at home. With a few solid staples, you can go from India to Indianapolis and everywhere in between knowing well and good that you’re doing your part for our planet. Sitting on a long-haul flight and want to snack on something other than peanuts or crackers? Wrap up your favorite goodies for the plane in washable, reusable, compostable food wraps! When you’re done, toss it in your bag, wash (in warm/cold water) and reuse again and again! Bee Akamai - Made in Hawaii, they have cute patterns and are all hand-crafted with Hawaiian sourced materials. Bee’s Wrap - Made in Vermont, they are made with jojoba oil, tree resin, and organic cotton, Bee’s Wrap has less of a waxy feel but that also means less grip when you try to wrap it around something like a bowl. LunchSkins - Created by moms with kids in mind, they come in an array of patterns and are pretty durable. Re-usable Silicone Bags - I have not personally tried these, but these can double for a toiletries bag, or a way to organize your cords while traveling as well. When traveling, I have often gotten asked, how do you go through security if you bring your own? Easy. Just go through security with an empty bottle in your carry-on and fill it at a water fountain on the other side. When you’re equipped with a reusable bottle that goes wherever you do, you’ll quickly notice the positive impact a sustainable water bottle makes for the environment and your wallet. 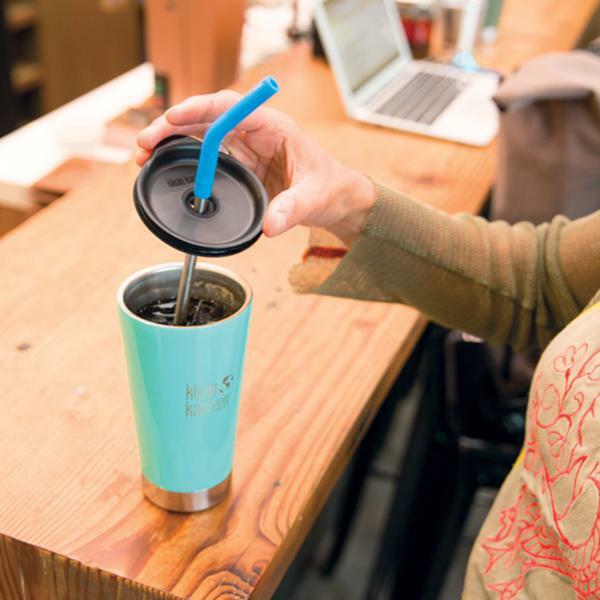 Whether you need your cup to be insulated, printed with vibrant colors, equipped with an option to infuse fruit, or simply a bottle to hold your water, its easy to find one that fits your needs. Klean Kanteen - Large selection of sizes, was one of the original reusable water bottle companies, gives back to the community. Hydroflask - Well made, insulated, comes in an array of colors and sizes and really do keep things very cold/hot. Mobot Nation - Its a foam roller and bottle in one so you can work out and stay hydrated on the go! You can also use it for back support on those long plane flights. The downside is they don’t have an insulated option yet, its a bit bulky, but with bright distinctive colors and design, it’s hard to misplace! By now, we’ve all witnessed the heartbreaking images of sea turtles, seahorses, dolphins, and other aquatic animals who mistake tiny bits of plastic straws for food. In 2019, a new law in California makes straws only available upon request--(plastic straws are already banned in cities like San Francisco, Santa Monica, Manhattan Beach, and Malibu). Straws are ‘the gateway plastic’ to start the conversation about plastic pollution, and the easiest way to make an immediate impact is to just say NO to them. Klean Kanteen stainless steel straws. A five-piece straw set costs less than $10, which means the whole family can slurp sustainably while on the go. They also have a silicone/stainless steel hybrid straw for kids, or the kid in all of us. Simply Straws - Glass straws that are uniquely made with sustainability and dental health at the top of mind. Sipping hot liquids is a cake walk with this straw while keeping tea/coffee away from your teeth, and it doubles as a stirrer too. You can also get them personalized with engraving! Silicone Straws - like these from Amazon fit right on your keychain and come with a cleaning brush, and are quite portable. When you’re on the go, you never know where or when you’ll get your next shower, and let’s be honest, sometimes the options are less than favorable! However, it’s easier than ever to protect your feet without wearing plastic flip-flops that last a month or two and then end up in a trash bag. Indo flip-flops are vegan and upcycled from tire soles! Plus, absolutely no fuel-powered machinery is used during the production process. Take these lightweight sandals to the beach, the boardwalk, or the hostel shower! 5. Plastic-Free Utensil Sets are the Way to Go! When you order to-go when staying at a hostel, hotel, or even a friend’s house, how often do you end up eating with plastic cutlery? For most of us, the answer is quite a lot. With three meals a day, that’s three different opportunities for us to make a choice that doesn't fill our landfills and oceans with more plastic! Buy a To-Go Ware Utensil Set, and you’ll be prepared for any meal. Soups, salads, and even slurp-worthy noodles can be enjoyed with this fork, knife, spoon, and chopstick set! When you’re on the go, this plastic-free travel set can rest easy in your backpack, luggage, or purse. Hosting a bachelorette, birthday, or holiday party? You can show off your fun and flare without ever buying single-use plastic cups, plates, utensils, or party favors! With brands like Susty Party, you can dine on sugarcane plates, toss out the garbage in compostable trash bags, and wipe up with their adorable, recycled napkins. And if you’re looking for a totally zero-waste option, you can rent or thrift cheap glassware to give your guests an elevated experience without harming our planet in the process! You can also buy mason jars (about $1 each), have people write their names on cute labels for use during the party, and have them take their glass jar home as a party favor. Those reusable grocery bags that you use for shopping are great accessories for plastic-free travel. 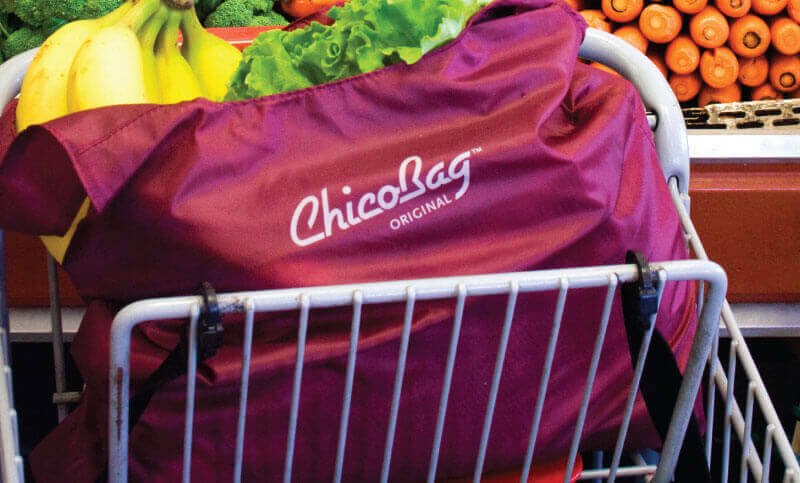 One of my favorite brands with quality, sturdy re-usable bags are Chicobags. Do you need to browse through a convenience store to make breakfast at your AirBnb? Bring your bag. Do you have to walk to a laundromat for fresh clothes? Bring your bag. Want a place to store snacks and other travel essentials while taking a bus, train, or plane? Bring your bag! Multi-use items are always wonderful to have on-hand. And once you have them, you’ll find that the possibilities are truly limitless. You spend so much time and energy meticulously wrapping gifts for the ones you love, and where does all that paper end up...right in the trash! This time around, instead of wasting time and money, opt for a gift giving experience that really makes sense. Head to an antique shop or thrift store and dig through their tin boxes, glass jars, or even scarves! You’ll be amazed at the neat knick-knacks you’ll find that will perfectly suit your gift. Now, that lucky someone can enjoy their present, and they can reuse the packaging instead of tossing it in the trash. If you don’t have time to shuffle through a store, you can certainly find something lying around your home. Recycling newspaper adds a hip touch compared to traditional wrapping paper. Use twine or rope as a replacement for ribbon and add a fresh sprig of green, to bring it all together. Dentists recommend that you change your toothbrush at least once every 2-3 months. If you have a plastic toothbrush, that’s a whole lot of plastic waste that will virtually never break down. Keep your pearly whites fresh, follow the dentist’s orders, and do so ethically! With a toothbrush made from sustainable bamboo and plant-based bristles, you don’t have to worry about how your personal hygiene is harming our planet. Toss this plastic-free essential in your toiletry bag and hit the ground running. If you’re traveling to Coachella, Tomorrowland, or EDC-the Electric Daisy Carnival, picking out that perfect outfit is half the fun! But before you get #glam with the girls, think about whether your outfit is leaving a lasting impression with your friends...or with our environment! Yep, we’re talking about glitter! Glitter is really just a fancy name for microplastics. And these little specs of starlight can cause serious damage to our oceans and the diverse creatures that dwell there. If you want to shine at your next event, there are some wonderful biodegradable glitters on the market! 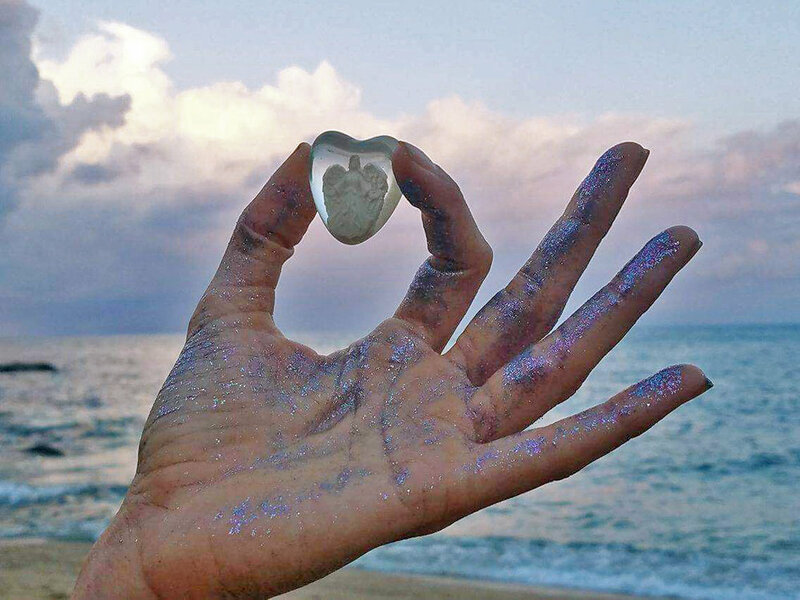 With its plant-based glitter in plastic-free packaging, Glitter Evolution is the perfect compostable option so you can shine, 100% guilt-free! Whether you’re heading to the park down the street or to an exotic destination worlds away from your hometown, you’ll want to leave a little extra room for these sustainable essentials! Plastic-free travel is the new wave, what will you bring along for the ride?